I’m a bit grumpy this morning and baking soothes me so I made biscuits. All the rolling out and cutting shapes is very calming. 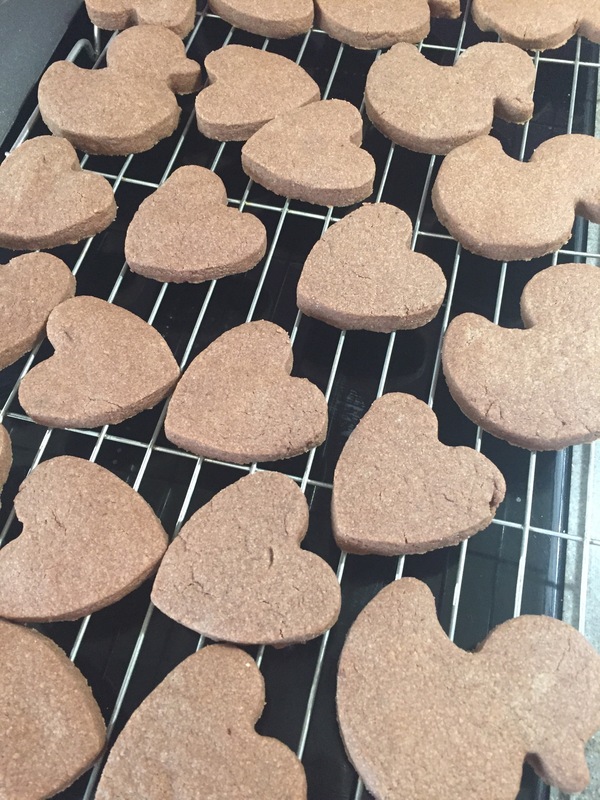 This recipe is adapted from a shortbread biscuit used in the mini gems on http://lucysfriendlyfoods.com/2015/08/11/iced-gem-biscuits/ and makes approx 30 biscuits depending on the size of cutter you use. Add stork lumps and vanilla essence and rub together until mixture resembles crumbs then combine into a soft dough. Alternatively fling the lot in a food processor and pulse until the dough comes together. Divide the mix in half and place on a floured sheet of baking parchment. You can roll it out between two pieces of parchment or do what I do and just flatten it to your desired thickness with the palm of your hand to approx 1/2cm thick. Cut out shapes and place on a baking tray. Combining and re rolling until you’ve used all the dough. I have fab baking sheets from Lakeland that don’t need lined or greased but you may need to depending on what you are using. I made two trays worth, bake the first batch while you are rolling out the second. Bake for 8 minutes then rotate the baking tray and bake for another 4 minutes. Allow the biscuits to cool for 5 minutes on the tray before transferring to a baking rack to cool completely. Biscuits are lovely on their own, dipped in dairy free custard or sandwiched together with dairy free ‘butter’ icing. These biscuits are also good without the cocoa.